La retraite de ce amoureux de la nature se repose paisiblement sur une colline avec une vue spectaculaire du lac Vernon et les bois autour. Avec une exposition plein sud et vue panoramique, il est vraiment à couper le souffle dans toutes les directions. Situé à Muskoka seulement 15 minutes de Huntsville, mais un million de miles de tout cela. Un charmant cottage de 2 étages idéal pour les groupes matures de jusqu'à 8 personnes ou 2 familles. Chaque niveau dispose d'une cuisine, salon, terrasse, deux chambres et salle de bains. Les ventilateurs de plafond, les foyers à gaz et de grandes fenêtres offrent un confort total et une expérience agréable. acteurs de l'internet et DVD sans fil haute vitesse sur les deux étages permettent à différents groupes d'âge de se divertir tout en chalet. Salon autour sur le pont ou tremper dans le bain à remous 8 personnes en plein air tout en regardant les étoiles. Prenez la voie et les escaliers vers le lac où vous trouverez 200 sq. Ft. Quai pour l'amarrage de votre bateau ou de sauter dans pour une baignade rafraîchissante. Profitez des canoës et des kayaks avec une palette de loisirs ou une exploration énergétique du lac. En chemin, vous trouverez votre propre terrasse d'observation avec vue étonnante falaise. La plate-forme d'observation vous offre un endroit isolé pour se détendre et admirer le lac en toute intimité. Au bord de l'eau, vous trouverez la végétation naturelle le long des 150 pieds de rivage privé et un fond de sable / caillou dur emballé pour la baignade. Bateau ou conduire 15 minutes à Huntsville, magasins, restaurants, golf de classe mondiale et parc Algonquin. En hiver, profitez du vaste réseau de sentiers de motoneige de Muskoka à travers les forêts, les lacs, les ruisseaux et les collines qui s'étendent de la baie Georgienne au parc Algonquin. Après la première chute de neige en automne et en hiver, le stationnement est sur la route en dessous du chalet. De là, vous montez une colline jusqu'au chalet. Le sentier qui monte la colline peut être glissant à cause de la neige ou de la glace en hiver et peut poser problème aux petits enfants ou aux personnes qui ont de la difficulté à marcher. Linge de maison inclus dans le coût. Le jour de changement en été est normalement samedi. Le jour de changement au printemps / automne / hiver et la première / dernière semaine de l'été est flexible. We (a group of three ladies) stayed in this property in September 2018 for 5 nights. It was a very nice experience with many great amenities. The Pros: The house was very clean, furnished sparsely, but comfortably. The kitchen was fully stocked with utensils and plates, the fridge with ice, a few essential spices and other commodities (e.g. coffee filters, toilet paper and paper towels). The hot tub was a huge bonus and it was a bit rainy for a few days, so a nice drink in the hot tub meant that we could sit outside. The dock was also very nice and had a canoe and some kayaks, which were great. Life jackets were also available. The lake was still warm and very pleasant. There was a nice black dog called Cisco that visited us daily and made himself quite at home, though I believe his owners lived next door. Les, the owner, was very supportive. He helped answer my questions, and tried to deal with some of the challenges we faced when a storm knocked out the power to Huntsville and the surrounding area, and destroyed the internet. Cons: This house is on a really steep hill, and while I knew this from other reviews, I was not entirely prepared for the level of steepness, both to get up to the house and to get down to the docks. It would not be suitable for anything less than a 4 wheel drive vehicle, and, if you went down to the docks and forgot something, you'd be cursing yourself for 450 steps on the way back up. We would stay here again. For the price and what it offered it was very appropriate for our needs. It was an enjoyable few days and offered us the chance to get away from it all and relax - yet it was close enough to Huntsville that we could shop and get groceries with relative ease. We stayed at the house for one week as a small getaway from the city after our wedding. The house is in a great location, very peaceful and quiet, we couldn't have asked for more in that respect. 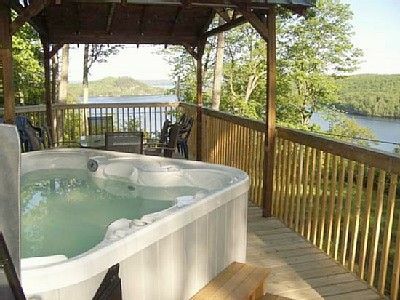 The hot tub and views are definitely the best part of this rental. The owner was very responsive prior to and during our stay. When we had a minor leak issue after heavy rainfall, he sent somebody to repair it the next day, which was greatly appreciated. The house itself definitely needs some love - the showers have signs of mold and mildew on the walls and some of the wood out on the back deck and stairs is splintered and slightly unstable. Not suitable for children or elderly. We also had to re-wash all of the bed linens because they smelled musty and damp when we arrived. The hike down to the water is definitely not for the faint of heart, and would probably be quite challenging for children or elderly visitors. Finally, the price seems a bit high to not include a cleaning service. Overall, we enjoyed our stay, if only for the beautiful location, hot tub, and the opportunity for some respite from the city. A buddy and I were burnt out from work and the hustle and bustle of city life. We decided we needed to get away from civilization so we recruited our girlfriends and headed to Deer's Leap in early May. Although only 15 minutes from downtown Huntsville, most of the time during our stay at the cottage we didn't see another soul. We were just immersed in nature and beauty. Standing atop a mighty hill, Deer's Leap offers unparalleled views of lake Vernon. The cottage itself is so cozy and exactly what we’d hoped for. Large windows allow spectacular views from every room, and the bedrooms have walls that open to allow better viewing of the lake. Deer’s leap is essentially two cottages in one. The queen bed I slept in was very comfortable and the late night hot tubbing put us in a sheer state of relaxation. The hot tub is a major bonus. Although it was too early in the season to swim in the lake, we did venture down the footpath to the dock and spent some time basking in the sun with some drinks. A lovely spot indeed. Deer’s Leap had a great selection of board games and videos to choose from, some of which I haven’t seen in ages. We did venture to Huntsville a few time during our stay, there is a cute main street with shops and restaurants to entertain for an afternoon and evening. I really recommend checking out Lions lookout point. Deer’s Leap is an amazing cottage- serene, peaceful, and isolated in the best way, with the most picturesque views. The name is also quite appropriate since we spotted numerous deer trotting past the cottage throughout our stay. I can't recommend this cottage enough. In fact, I have already booked a 2nd stay in mid-June. I'm sure I will have an even more glowing review once the lake warms up for swimming. This cottage should simply NOT be listed as a 4 season rental. And it was really overpriced for the quality and cleanliness of the place. First, the cottage was completely inaccessible for our Feb 17-20 stay. The fact that visitors have to hike up a huge (more than 500 feet) steep, unshovelled hill through deep snow was not made clear. All we found buried in the rental agreement (downplayed in the ad) was only a short statement about having to park on the road because the driveway is not plowed in winter. That was very misleading. The driveway actually isn't accessible at all in the winter. When we arrived by car at the road's end, it was hardly obvious where cottage was. No signage. No pathway. You couldn't even see the cottage from the bottom of the hill. it took between 5 and 10 minutes to hike one trip through the woods up an incredibly unsafe hill from our car. That is UNACCEPTABLE for a winter rental. Without a local neighbor's generous help (to bring our luggage and food to cottage) with his snowmobile - it would've been next to impossible to actually get a weekend's supplies to the cottage. It was an awful experience. Neither the owner nor HomeAway should be listing this as an accessible winter rental. Especially for the high price we paid. 2) In addition to the accessibility issues, once we arrived and tried to settle in for the weekend we discovered mouse feces all over kitchen (in the utensil drawers, in many pots and pans, in bowls in the cupboard, on the fridge, in drawers, and on the placemats on the kitchen table. It was gross. We encountered a lack of basic cleanliness throughout the cottage with dead bugs basically glued on ceiling from spraying and not cleaning. 3) The main floor gas fireplace was simply not working. 5) Some things could use a bit of fixing / maintenance- and patio door was leaking significantly after warmer temperatures caused some thaw). Our family has been renting Ontario cottage properties in all seasons for over 10 years. This is by far the worst experience we had. The views are nice and the hot tub was nice, but none of that can justify the price given the accessibility and upkeep issues we encountered. We had a great time away with our friends and assortment of amenities available, but in hindsight felt the property was very overpriced for a winter stay. There is no safe pathway up to the cabin in winter and we are thankful we are fit as it's not an easy walk as it is. While guests are warned of this in the long list of instructions, the path was snowed in and icy and very dangerous, especially in the dark as there are no lights. Don't stay here in winter if you're not prepared or physically capable, it's quite a hike. Additionally the balcony's are not well kept - completely covered in mounds of snow and ice, nothing has been done to clear this away. The wifi did not work the entirety of our stay, and while Les tried to assist via email nothing was resolved. No cleaner included in price, and had to do cleaning ourselves - being on holidays we would have preferred the option to pay extra for a cleaner. Hot tub was definitely the highlight, and we enjoyed using this and taking in the amazing views that the position of the property had to offer. Plenty of private rooms and beds which was great. House is cozy but very outdated and needs some fixing here and there. Hence why we felt after our stay that it was quite overpriced compared to other properties we have stayed at. Beautiful area though and great location. Thank you for your comments. We're glad you had a great time away with your friends and enjoyed the great view, hot tub and amenities. We're sorry you found the winter conditions to be an issue, there was a lot of snow that came that week. The cottage is in the woods on a hill and offers fun winter opportunities for people who enjoy snowmobiling, skiing or toboganning with their kids. I went to the cottage after your stay to check the wifi. While I'm not sure why it didn't work when you were there, it is certainly working now. I even had Bell check it out to make sure just in case. We're glad you enjoyed the using the hot tub and the amazing views and great location. Our family had a terrific week at Deers' Leap cottage and we enjoyed all of its amenities. Les was very prompt in answering all of my emails and addressing any questions/concerns prior to our arrival. We found that everything was exactly as represented and all of the detail in the instructions that were provided was much appreciated. The lake was beautiful, the scenery spectacular, and the cottage was very comfortable for our family of eight. We would highly recommend this cottage for a Muskoka vacation. Early booking discount: $100 off all weekly bookings made before February 29, 2019. 3 day long weekends in February, May, September, October and December are minimum 3 night rentals, $1475 for the 3 nights. First two nights charged at weekend rates. Please email for rate for three or more nights. Security deposit is $500.